DUCK DONUTS Superbowl GIVEAWAY! Go Rams!! Go Rams!!! We are so excited for the SUPER BOWL!! 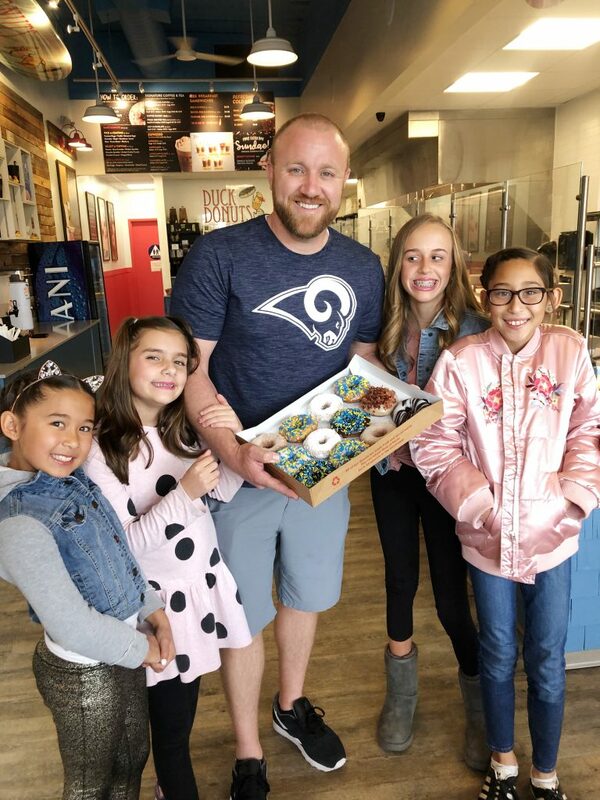 Even more exciting is that DUCK DONUTS Huntington Beach has teamed up with us to offer 2 of our LUCKY READERS a chance to WIN A DOZEN RAMS DUCK DONUTS for their Super Bowl Party this SUNDAY (Scroll to the bottom of this post for how to enter!)! If you don’t know about Duck Donuts yet you are missing out! Check out our post on them HERE. Just think warm fresh donuts fried and made to order while you wait! You really can’t beat them! Also be sure to PRE-ORDER your Super Bowl Donuts so they are hot and ready for your party this Sunday by calling 714-375-5430 (HB location)! Check out THE BIG GAME ASSORTMENT! Charlotte is amazed they match her daddy’s favorite team colors! These girls are hugging their daddy goodbye as he prepares to cheer on his team in ATLANTA!!! Duck Donuts first then he’s Super Bowl bound! But seriously… don’t be jelly, fill your belly! 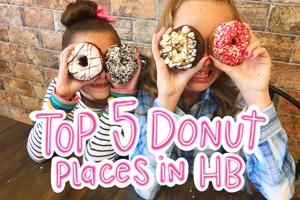 And WIN your own DUCK DONUTS below! 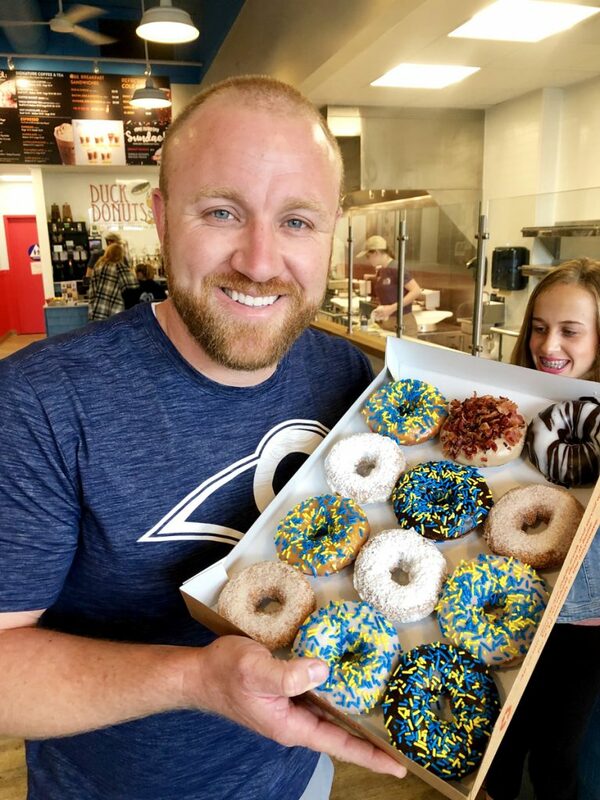 Head to our INSTAGRAM GIVEAWAY HERE, like us and tag some friends for as many entries as you want to win a DOZEN RAMS DONUTS for THIS SUNDAY! Details are in the post. OR head to THIS FACEBOOK Post for a chance to win ANOTHER DOZEN RAMS DONUTS! Details are in the post. WINNER WILL BE ANNOUNCED THIS FRIDAY FEBRUARY 1ST! GOODLUCK! If you win we expect an invite to the Super Bowl party! Woohoo! ps.. speaking of Sundays… did you know Duck Donuts has Donut Icecream Sundaes??? 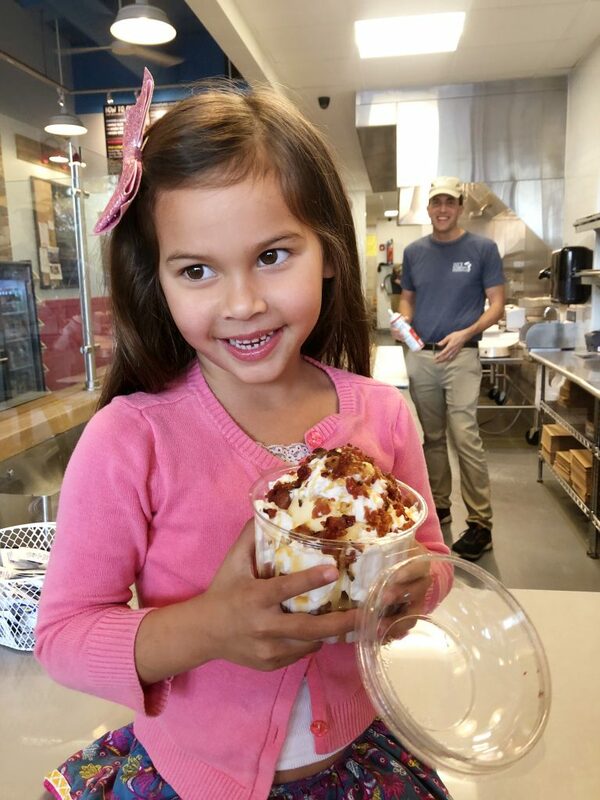 Check out little Lucy and her caramel bacon donut Sundae below. She did not share! « GIVEAWAY to the Queen Mary Christmas!! 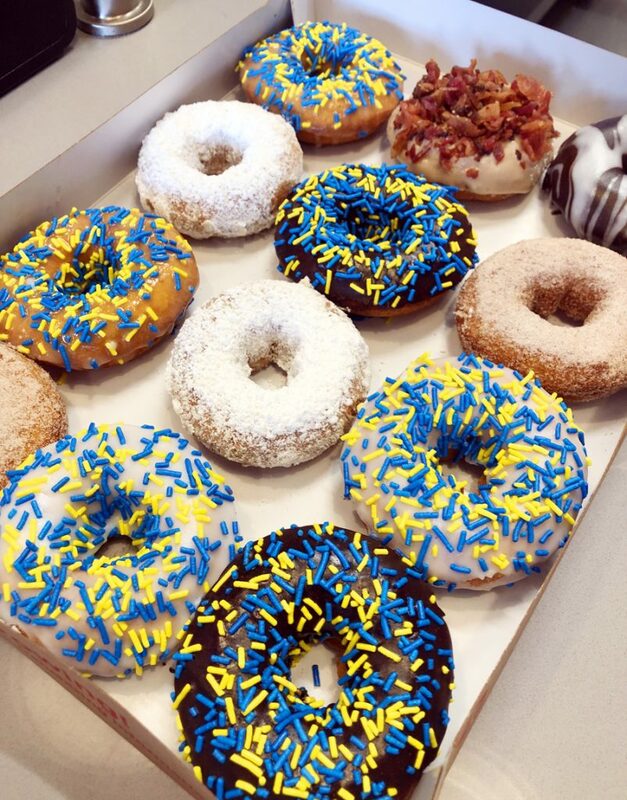 These donuts would be a perfect addition to our Super Bowl party! Go Rams!! We love Duck Donuts and GO RAMS!!! Go Rams! Love Duck Donuts! Yummy! I need these donuts in my life!! Thank you. What a fun idea. GIVEAWAY to the Queen Mary Christmas!! Christmas at the Queen Mary Where Holidays Set Sail! FREE BLOWOUT from Del Sol Salon in Huntington Beach! 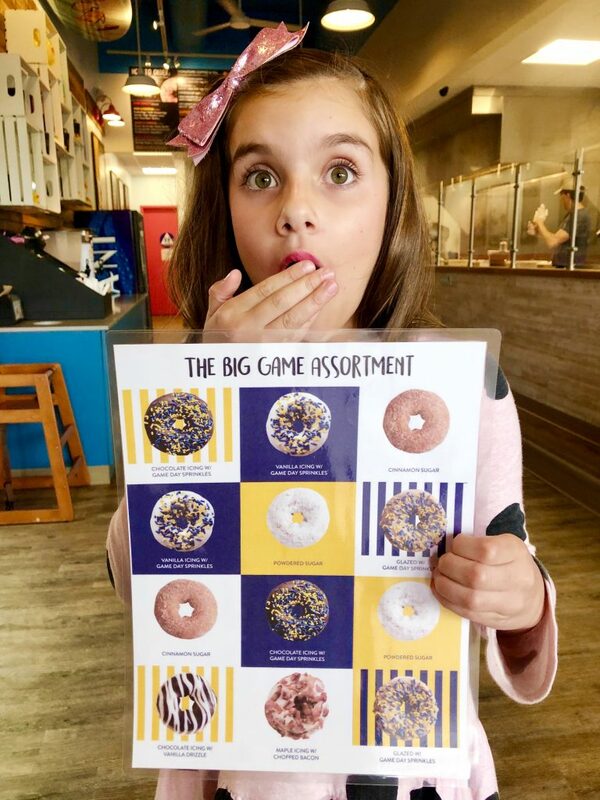 Duck Donuts + 2 GIVEAWAYS!! 5 FUN things for FAMILIES to do at the VANS US OPEN OF SURFING in Huntington Beach July 28- Aug 5, 2018! 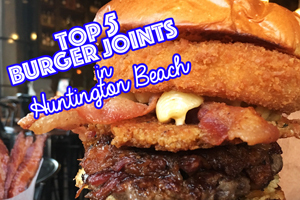 5 FUN things to do in Huntington Beach THIS weekend July 21-22! JIMBOY’S TACOS Huntington Beach + $50 GIVEAWAY! ANTHROPOLOGIE & PIGGY AND DIRT GLASS STAR GIVEAWAY!